It is truly a great occasion that has gathered us all together today. We have gathered to inaugurate our year long celebrations of the 150th Anniversary of the dedication of this Church by Archbishop Paul Cullen, later to be Cardinal, on the 18th August, 1861. I happily join with my fellow priests, Canon Piert and Fr. Michael Murtagh, our Pastoral Council and our Jubilee Committee, in extending a very warm welcome to all of you who have joined us for this celebration. In welcoming you all I am conscious that our Parish is not only the area served by Sts. Mary and Peter Church here, but includes the very vibrant communities of Johnstown and Coolgreaney, served by St. David’s Church. I welcome parishioners too from Castletown parish with whom Arklow has had a long association together with visitors from our neighbouring Parishes and beyond. I welcome all our visiting clergy – especially Monsignor Colm Gallagher. I take this very public opportunity, in his presence, to acknowledge the enormous contribution that he made to this parish over almost a quarter of a century. We will be joined by more clergy when they are free from Masses and Services in their own churches. I am delighted that the other main Christian Churches in the area are represented. I value greatly the warm, personal friendships and relationships that exists between us. A very special welcome to all of you who are joining us from home by our radio link throughout our community. In a few moments, Mr. Ronnie Delaney will formally launch our celebrations for the year. I am very grateful to him for so readily agreeing to come back home to the town of his birth for this special occasion. You might well ask why year long celebrations when we could mark this great milestone in our history by a single day or week end event? Very simply the Jubilee organizing committee, under the very able chairmanship of Jimmy Dunne, together with our Parish Council, under the very hardworking and dedicated leadership of Hilary Sharpe, were of the view that there was an enormous amount about our church and parish to celebrate and that it was very important to give time to very many different celebrations over the year, month by month, so that various aspects of our parish life could be acknowledged and celebrated. While the programme for the year is pretty well fleshed out by now, there is still room for other ideas and proposals. Our Jubilee Chairman, Mr. Jimmy Dunne, in his introductory words of welcome captured perfectly, in my opinion, what these jubilee celebrations will be all about when he said we will retrace our history, strengthen our faith and build for the future. Please God, over the coming year, in the different Jubilee events, we will do just that. We don’t have to do all of it today, but hopefully as we go home today we will all have a flavour of what is to come and it is my deepest hope that very many of you will enthusiastically engage with the years events. When we start to retrace our history we realise that there is much to be grateful to God for. One of the first things that we very quickly discover is that there has been a very strong Christian community in this area going back to the beginning of the Christian era in this country and that in both times of peace and persecution it continued to flourish and to bear witness to Christ and his message. That community has been served by a variety of churches and chapels over the centuries as the inscribed tablets in the main porch of our Church reminds us. This year we give thanks for this particular church building dedicated to Sts. Mary and Peter. But what would this beautiful building be without its people, its community, its flesh and blood? So, our thoughts of gratitude and thanks go back to Fr. James Redmond, the Parish Priest of the time, and to the people of the parish in the late 1850’s. He was a strong and forceful character who got things done and the people were loyal, generous and committed. Together they managed to build this Church only a little over a decade after the Great Famine of the mid to late 1840’s. It was built at a time when many people were very poor. Very many people contributed in different ways to its construction, none more so, I am told, than the fishermen of Arklow. There will be a special celebration as part of our year, to acknowledge their huge contribution not only to the building and maintenance of this Church, but, to the wider community as well. It would be impossible to think about Arklow and not think about the fishermen. Archdeacon Redmond acknowledged too at the time the support given by some of his Protestant neighbours towards the building of this church. So, there is a great deal to be grateful for. On this day we think not only of the history of this beautiful Church, we think very much also of the place it has in the heart of this community. It has served as a place of prayer and worship for generations of people. 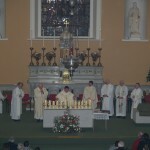 Think of the many thousands of people and families over the past 150 years who have celebrated the joys and sorrows of their lives here – christenings, first confession, first communion, confirmations, weddings, ordinations, family funerals both in the normal passage of life, but often too with great tragedy. What an amount of memories this sacred place holds for so many? We give thanks on this day and during this year for all those who have ministered and worked here in this church and parish, clergy, religious and laity. I’m sure they did their best even if it didn’t always seem that way. I am hoping that our various celebrations throughout the year will help to deepen and renew our faith. I hope that this church will always be a place of prayer, a welcoming and hospitable place especially for anyone who may feel at a remove or alienated from it. I am sure it will never be perfect, but we will continue to strive to make it what Jesus Christ would want it to be. The special logo that we will use throughout the year and which is on the front of your booklet today, connects easily with the fishing traditions of Arklow -the boat, the net, and the fisherman. At a deeper level, the logo draws its inspiration from todays Gospel, Luke 5: 1 – 11, where Jesus encourages his disciples to cast out the net for a fresh catch of fish. It is St. Luke’s way of reminding the disciples, and us as a Parish community, that we too need to be constantly casting out, reaching out to others, so that the message of the Gospel may reach a new generation or touch afresh any of us who have drifted away for whatever reason. We must do that in this time of constant change and uncertainty. But, we do so confident that the Lord is with us and will be with us as he promised. That is the challenge of the year for us.